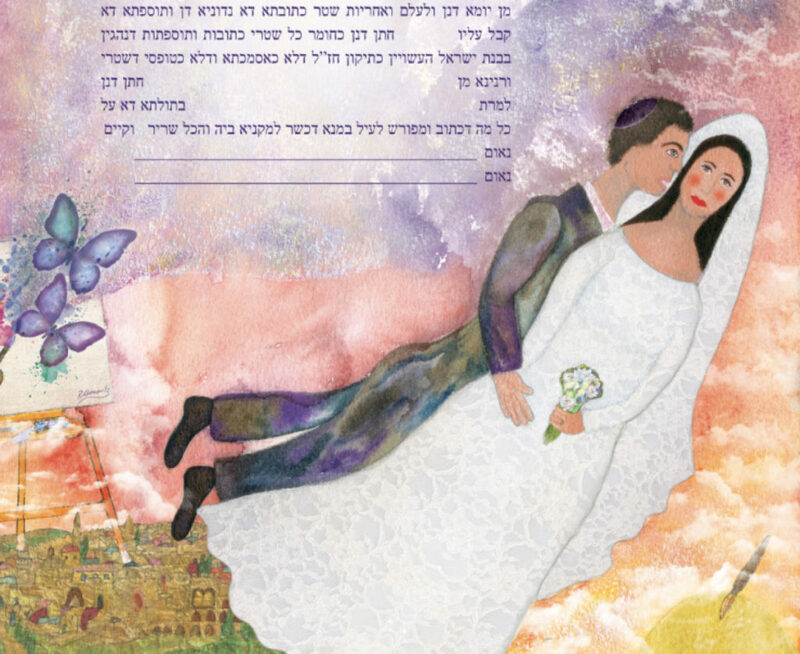 As life, love and colour flow forth from the artists brush, time and space float freely across this dreamscape inspired by the legacy of Marc Chagall and his heritage stylistic signature of floating Bride Grooms and Jewish shtetl life. In the bottom left, an easel supporting a meta-referential canvas emerges from a landscape of Jerusalem, the Holy and Eternal City of Gold.Magic materialises as the veiled presence of the artist is gestured through the art palette and brush from which the life force of creativity and imagination erupt. 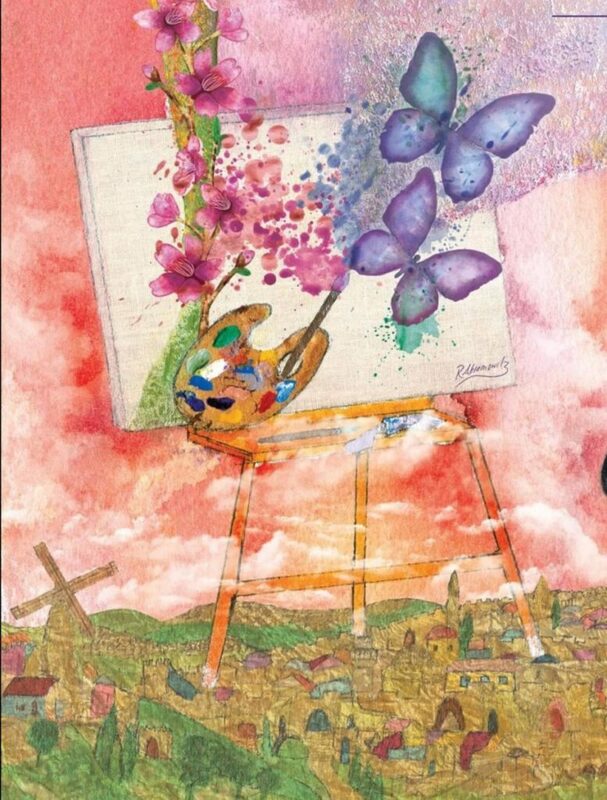 This stream of creativity is expressed through the pair of butterflies that fly forth from the paint splatters of the brush and beyond the canvas into the fluid potion of the wider dreamscape and composition. 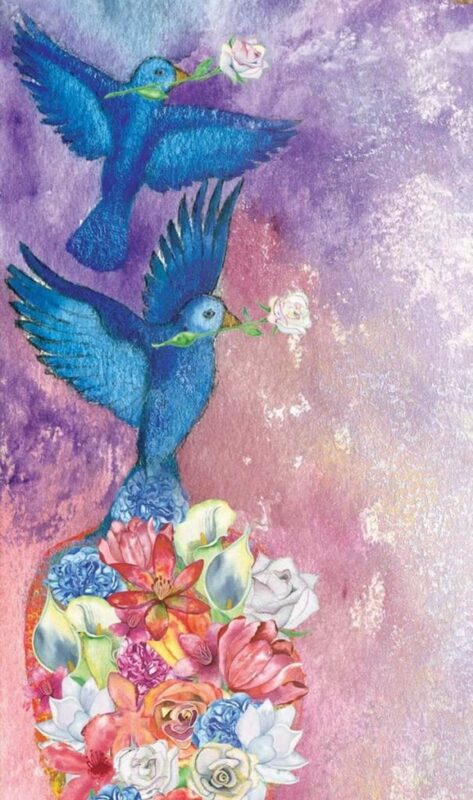 In tandem, a pillar of flowers blossom into a towering bouquet from which a pair of star crossed blue birds carrying roses fly away, symbolising a union of love released into the skies of life. 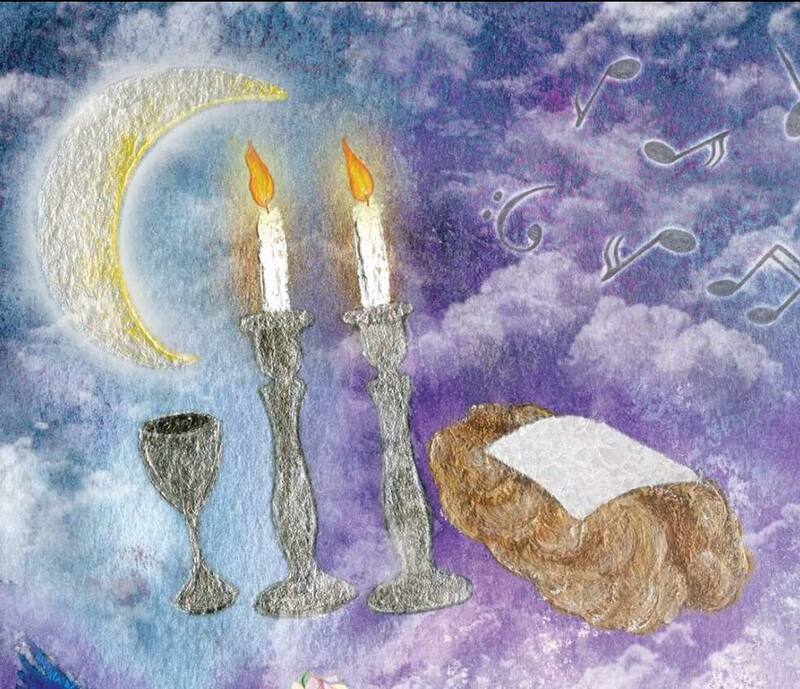 Above in an enchanting star studded hybrid twilight and midnight zone, the ritualistic tokens of Shabbat; the candle sticks, wine glass and challah with lace cover (matching the brides dress) float in a metaphysical soup of Tradition, Tradition and eternity whilst basking in the light and glow of a crescent iridescent moon. In the centre of the upper night sky is the Eternal flame of love, burning fiercely in a metallic cauldron. This Ner Tamid is the forever light that flickers to symbolise Hashem’s infinite presence in the synagogue of life and the universe. 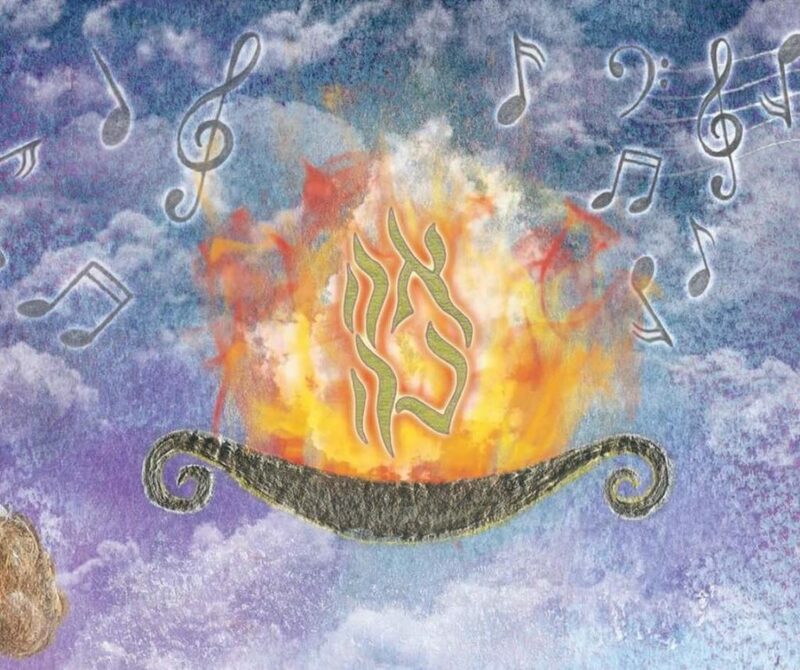 In this flame, the Hebrew word for Love “Ahava” radiates and dances. 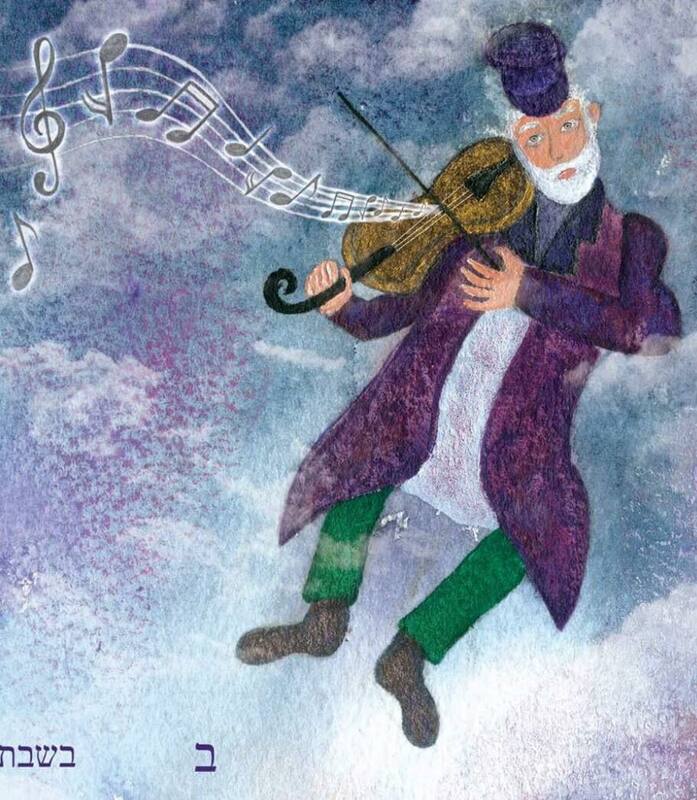 A fiddler [on the roof] of the sky – a central motif of Chagall’s vocabulary plays a string hymn that conjures iridescent music notes which float and fill the space of the sky and envelop it in a chorus of love. 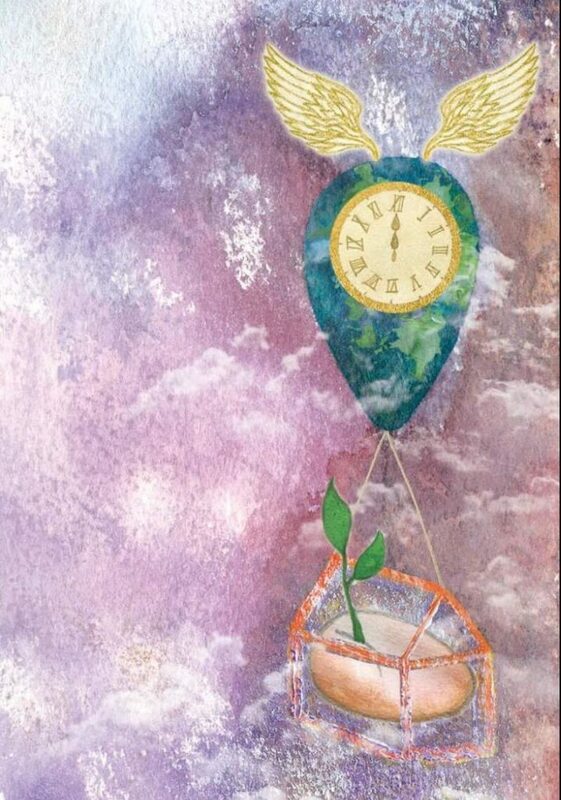 Beneath the violinist is a gilded winged hot air balloon, in which an antique clock face overlaying a watercolour wash of planet Earth drifts into the sky. Carrying a home, housing an egg from which a plant grows forth together symbolise family, prosperity and fertility. Its ascent into the heavens is a metaphor for the way in which the couples love transcends time and space – flying and floating. In the bottom right corner, diagonally across to the soft wise light of the moon is the radiant joyous light of the rising sun which fills this artwork with light, warmth and love. The sun is being created, crafted and painted by a brush which once again honours the creative genius of Chagall. Above here are the central figures of this love story and tropes of Chagall’s repertoire – a floating Bride Groom. The man gently carries his beloved wife whose lace dress, white bouquet and gold wedding band visualise their recent being and becoming under the Chuppah. Married, majestic, magical, magnificent. They now in the embrace of each other fly above the landscape (where we started our story) and into this world in which dreams are more beautiful than reality, where life defies gravity, where songs are seen in colour like no other, where tradition floats as Shabbat artefacts under the moon, where butterflies and birds are boundless, and where fantasy flirts with fiction. This is a Ketubah visualising a dreamscape that crowns the art of love, and the art of love. 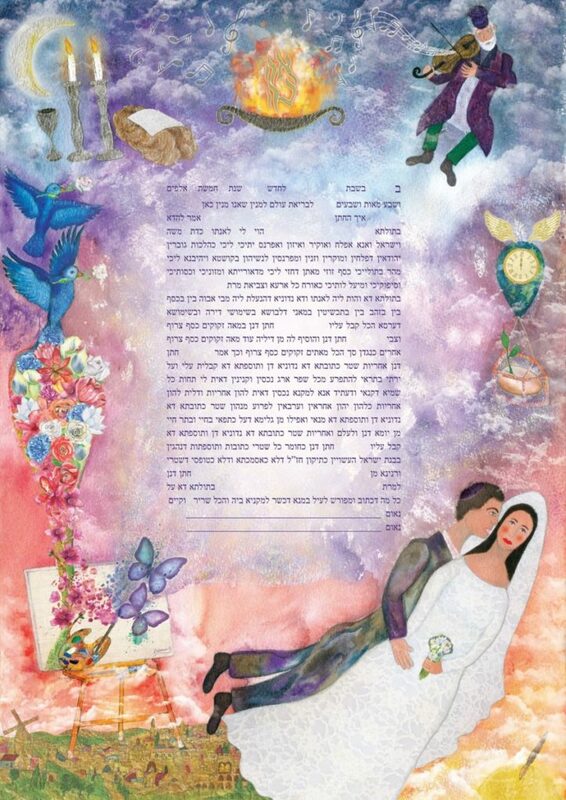 This Ketubah is dedicated to the memory and legacy of Marc Chagall (1887- 1985) and the beauty he gifted this world, on the canvas and beyond. Should you wish to have any element varied (such as rendering the Bride’s hair blonde, for example) get in touch. Let’s personalise it and make it your own.